The AGM of Rio Tinto plc took place in London on Thursday 14 April. For more photos, see http://galleries.shatziephotos.com/RTZAGM/index.html. On 14 April 2011, London-based Rio Tinto plc held its AGM (annual shareholders’ meeting) in London. 14 April also marked the thirtieth anniversary of the first concerted intervention by “dissident shareholders” in what is now the world’s third most powerful mining company. In 1981, these shareholders launched the “People against Rio Tinto” (Partizans) campaign. And some of them have attended every AGM since then, bringing with them community representatives and trade unionists from almost every country where the company operates. Collectively they constitute the most consistent corporate lobby of its kind, anywhere in the world. In 2007, Partizans was key to setting up London Mining Network, which co-ordinated activities around this year’s Rio Tinto AGM. As in previous years, the company’s highly questionable environmental and social record came under concerted attack from campaigners around the world. Chalid Muhammad, a prominent Green activist from Indonesia, demanded to know why the company had not fulfilled its undertakings to fully compensate local people for human rights abuses and loss of their land at Rio Tinto’s now-closed Kelian gold mine in Kalimantan – all responsibility for which Rio Tinto will relinquish in 2013. Meg Townsend, who works for a prominent New York law firm, declared the company had failed to observe the religious rights of Native Americans at one of its prospective mine sites in Michigan, USA. Also from North America, Cherise Udell representing “Utah Moms for Clean Air” pointed out that residents of Salt Lake City, and in particular young children, were grievously suffering from toxic emissions at the company’s massive Bingham Canyon copper mine. Patricia Feeney, director of Oxford-based Rights and Accountability in Development (RAID) raised urgent questions about the impacts on water quality of the company’s proposed Oyu Tolgoi copper-gold mine in Mongolia. Other questions related to the company’s position on the rights of Indigenous Peoples to withhold their consent for mining projects, including at the Pebble project in Alaska. The issue was also spotlighted in a letter by a leader of the Aboriginal Mirrar people in Australia, who fear for the consequences of the company’s uranium extraction on their territory – extraction which, they believe, may have helped fuel the Fukushima disaster. The question and answer session lasted two hours – one of the longest since Rio Tinto first became a “battle ground” between communities and the company in 1981. “It’s not a case of winning or losing. On the one hand, Rio Tinto has certainly made some concessions to its opponents – for example selling some of its more dubious coal mines. “On the other hand, the gap between its promises and actual performance is as wide as ever. “For example, the company says it’s in contact with aggrieved Indonesian communities still suffering from lack of compensation for the impacts of its closed-down Kelian gold mine. But, as Chalid Muhammad pointed out today, their grievances have remained unaddressed for the past couple of years. “The company says it’s always ready to dialogue with its ‘stakeholders’. And, one of these stakeholders, Cherise Udell, made a passionate plea on behalf of thousands of children affected by toxic emissions from the company’s Salt Lake copper mine. 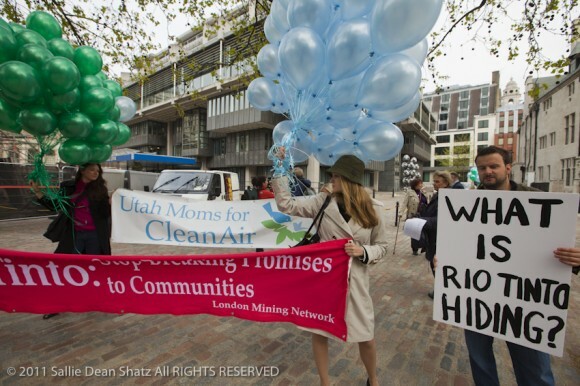 Outside the AGM, Utah Moms for Clean Air led protests against the company. Colourful balloons were burst, each representing a premature death because of air pollution caused by the company’s operations at Salt Lake City. Air pollution in the area causes between 1000 and 2000 premature deaths per year, and Rio Tinto’s Kennecott subsidiary is blamed for 30% of this pollution. Link to webcast of Rio Tinto AGM, including all questions and answers: http://www.riotinto.com/shareholders/12361_agm_2011.asp (registration necessary). Background report, Rio Tinto: are they telling us the whole truth? at http://londonminingnetwork.org/2011/04/rio-tinto-are-they-telling-us-the-whole-truth-2/. One of the highlights of protests at last week’s Rio Tinto Annual General Meeting was the presentation of an appeal to the UN from Australian Aboriginal elder, Yvonne Margarula – raised by a British colleague to the company chairman. In her letter Yvonne Margarula, representing the Mirrar traditional owners, re-affirmed her people’s implacable opposition to Rio Tinto’s ERA subsidiary expanding its uranium mining, by entering on its territory. Ms Margarula voiced her people’s solidarity with the citizens people of Japan in the wake of the recent tsunami and the disaster at the Fukuruma plant – one fuelled by uranium dug up from Australian Aboriginal territory. See http://www.minesandcommunities.org/article.php?a=10840.